Bean bags made from lambswool add a touch of casual elegance and luxury to any room, but a dirty bean bag won’t make a good impression. Caring for lambswool bean bags isn’t difficult, but it is more involved than simply throwing the outer shell in the washer. Taking the time to give your bean bag the treatment it needs will keep it looking clean and extend its lifespan. Lambswool is gathered from a sheep’s first shearing, which usually happens when the sheep is around seven months old. The fibres are usually no more than 50mm long, giving lambswool a soft and elastic feeling. Lambswool is durable and naturally resistant to dirt; unlike cotton and other plant-based fibres, lambswool contains natural oils that repel water and dirt. Lambswool is a robust material, but there are some general tips that will extend its longevity and maintain its appearance. First, minimise the fabric’s exposure to sunlight and other sources of UV radiation. UV rays can degrade the fibres and cause the colour to fade. Give your lambswool bean bag a shake on a regular basis. The fabric is durable and won’t be damaged by a vigorous shake, and the shaking action will fluff up the fabric and loosen any dirt or dust trapped in the fibres. Avoid using a vacuum with a turbo action or a rotating brush head. Brushes can get caught in the fibres and damage the fabric, giving it an unwanted frizzy appearance. If you want to vacuum your lambswool bean bag, make sure to only dry vacuum it. If you do spill anything on your lambswool, clean it up immediately. The fibres provide resistance to stains, but if the stain isn’t treated immediately it will overcome this initial resistance and settle into the fabric. Cleaning the stain immediately will prevent settling and allow you to get the most out of the fabric’s stain resistance. Finally, if your lambswool bean bag should somehow become thoroughly soaked, don’t rub or brush it while it’s damp. Handling the fabric when it’s damp can weaken the backing and cause fibres to separate. Some sheepskin products can be brushed to help maintain their appearance, but lambswool doesn’t need brushing. In fact, since the fibres in lambswool are relatively short, brushing can actually damage lambswool. If someone spills on your lambswool bean bag, spring into action immediately. The first step is to thoroughly contain the stain. Blot up liquid stains immediately using paper towels, but don’t rub the fabric; simply let the paper towel absorb as much liquid as possible. Scoop up solid stains with a knife or a spoon, but again, avoid using force that could push the stain deeper into the fibres. Don’t apply any liquids or cleaners to the stain until you’ve contained it thoroughly. After you’ve contained the stain, you can move on to cleaning the stain out of your lambswool. For most liquid stains, start with a wet stain remover. Apply sparingly; drowning the stained area in a liquid can cause more damage to the lambswool. Next, prepare a mixture of one teaspoon wool detergent, one teaspoon white vinegar and a litre of warm water. Gently dab the mixture into the stain to lift the soils out of the wool. Afterwards, blot up the remaining liquid. Certain liquids, such as ink, coffee, milk and other complex or thicker liquids, require specific treatments; if you’ve spilled one of these substances on your lambswool bean bag, look up the specific instructions for that material after you’ve contained the stain. You can use a dry stain remover on most solid or dry stains. After removing the excess material, spray a fine mist of the dry stain remover on the affected area. The stain remover will react with the stain to form a fine powder, which you can then vacuum up. Certain stains require treatments that are impractical or impossible for the average homeowner to provide. Bleach, eggs, faeces and rust will almost always require professional assistance for complete stain removal. For the most part, your lambswool bean bag won’t ever require a large-scale cleaning. Lambswool is naturally resistant to soiling, and spot-cleaning and prompt stain removal are usually sufficient to keep it looking and smelling good. To spot-clean your lambswool bean bag, gently rub any soiled areas with a damp cloth and a mild wool detergent. Make sure the cloth is merely damp, not sopping wet; excess water can cause damage to your bean bag. Don’t use bleach or any other chemicals beyond a detergent; these can react with the fibres and cause permanent discolouration. If you want to clean your whole bean bag at once, you’ll need to have it professionally dry cleaned. The suede leather back on our lambswool bean bags makes them vulnerable to damage from immersion in water, so dry cleaning is the only way to safely clean the entire bean bag. If your lambswool bean bag cover does get wet, don’t attempt to dry it in a dryer or iron it dry. Stretch out the fabric and lay it out to dry; you can either lay it out flat or hang it from a line. As you let it dry, make sure that it’s protected from direct sunlight. Lambswool is a luxurious and durable fabric, but it does require some extra effort to keep clean. 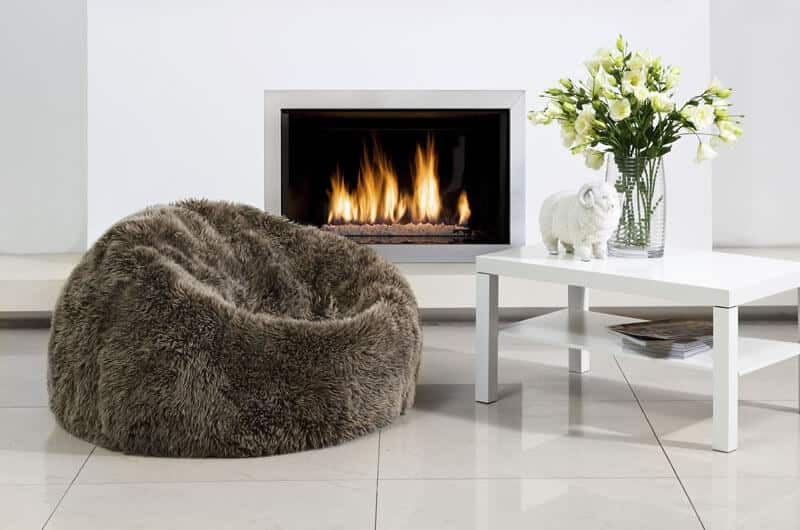 Treating stains immediately and taking the time to perform some routine maintenance will ensure that your lambswool bean bag remains an attractive and comfortable part of your room for years.